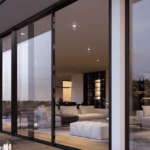 Schuco is a world leader in the design of aluminium windows and doors, energy efficient aluminium windows and sophisticated sliding doors, bifolding doors and glazing. Schuco has been trading for nearly sixty years, with a global operation in 80 countries. Such is the reputation of Schuco windows and doors, in Germany and across Europe, their products command 50% or more of market share. Anyone choosing Schuco window and doors is fitting some of the best windows available. 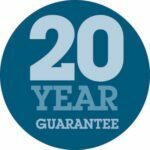 Why buy Schuco Windows and Doors? As well as innovative windows and doors, Schuco also provides solar solutions and is a significant player in creating energy-efficient products through the reduction of heat loss. Architects, building and construction companies specify Schuco products because of the solutions they provide in their buildings. From a basic square window to bespoke windows and doors with made to order technology and operation, few aluminium windows and doors can meet a client requirement like Schuco does. Latest technology and aluminium innovation are just two reasons why Schuco glazes some of the most famous buildings in the world. For your home, Schuco products give you modern, technically superior windows and doors that are designed with the know-how of their more advanced windows used in high-tech buildings. 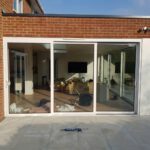 Choose a Schuco bifolding door, sliding door or window in your home and you benefit from some of the best design, security, thermal performance and durability there is. What Schuco products are available? Schuco aluminium windows and doors are available to suit every possible glazing requirement in the home. The range of Schuco products includes vast colours and special finishes, automatic or manual operation with many doors and windows and individually-tailored products. If you are thinking of having new windows, doors and glazing in your home, Schuco offers a big range to meet your needs. 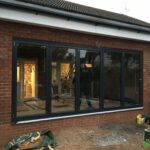 The main benefits of buying Schuco windows and doors are premium quality with an almost unlimited range of windows and doors. Security, noise reduction, heat loss reduction, contemporary style and long-term reliability come as standard. 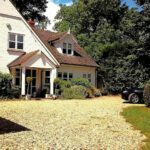 If you would like more information about Schuco windows and doors or would like to view some of their products, contact us today or visit our showroom.